We just adore Nancy over at Marcus Design and have for awhile! Last February we featured her unbelievable Ikea hack! The girl has got skills, y'all. And serious. style. We are so excited to feature her again today! We know you'll love her work as much as we do! Hello lovely S+S readers! A huge thanks to Lindsay & Lindsay for allowing me to participate in their fabulous series!! My living room has definitely been my favorite room in my own home to decorate. It's the spot we spend the most time in, so feeling comfy and pretty was high priority :) I quite literally had NO color in my home (grey, black, & white throughout) so I chose to add a dash of turquoise to liven the space and it really makes me feel happy. With a bit of tufting on the chairs, a mirrored cabinet, and little touches of pink here and there, the room has just enough of a feminine edge. 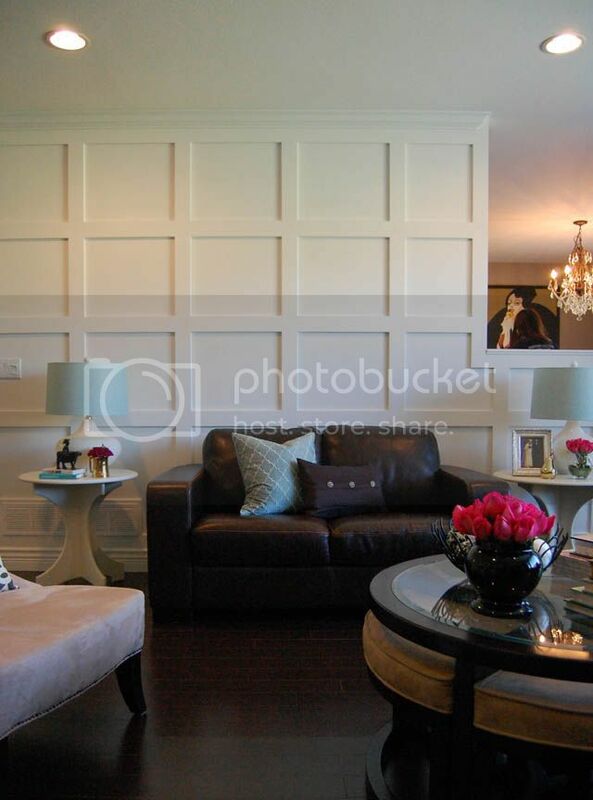 We recently added a grid panelled wall with inexpensive strips of MDF, and it brought the architectural detail the space was desperately needing! And since the fireplace surround and the panelled wall are white, it leaves the room feel brighter and larger. I have really enjoyed planning & decorating this room, though I am sure I'll be changing things up in here again sometime soon. After all a decorators home is never truly done, right? I hope you enjoyed the tour! Thanks again for having me here ladies! Beautiful..and agree she has some serious skills, no messing around! 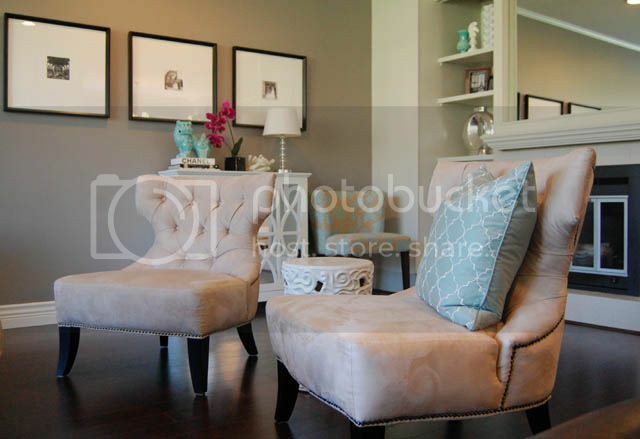 Gorgeous room, love those chairs! I love Nancy and her style. Her home is beautiful! Her recent wall make over brings the whole thing up like 10 notches. It looks like the home had so much original craftsmanship, I love it. The decor is also freaking beautiful. Nancy, where are the black frames with the large white mattes from? I absolutely love EVERYTHING about this room! 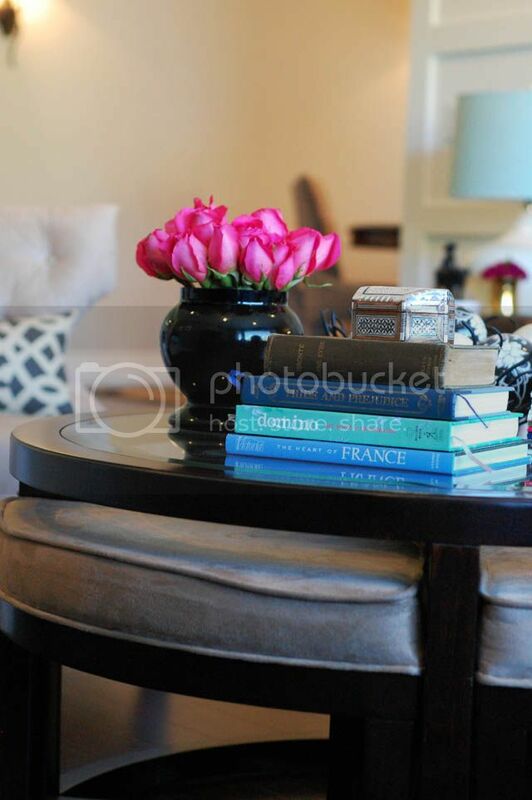 I love all the coffee table books...they truly are like art in and of themselves!! 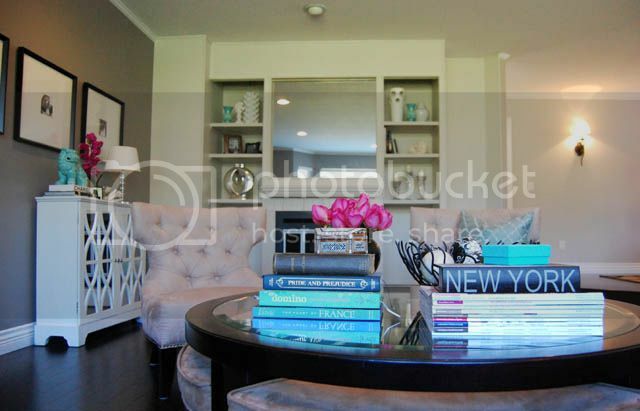 Love the calmness of the room and then the pop of the accent colors! Thanks for sharing!! I love Nancy and her DIYs are always amazing. This is a great feature! I love the large matted pictures! I'm going to the framers tomorrow to have something like that done! So dramatic! Thanks to everyone for your kind words! And Maggie, I had hunted and hunted for over-matted frames and could never find any ... so I bought 3 frames that came with pictures in them (from HomeSense which is HomeGoods in the US), ripped the photos and mattes that they came with out, and got inexpensive mattes cut to my specifications at my local art shop! Only about $10 a matte!! I really need to get back to finishing my home decor. I love this room, its so chic! This is a beautiful room.